"Valdespino is a tiny crown jewel of a winery that exists within a much larger wine and spirits company called Grupo Estevez. The goal of the winery is to use all the possible resources of the company to make some of the finest, most distinctive and artisinally-produced Sherries that are available today. This "spare no expense" approach applies to everythng from the entry-level Finos and Manzanillas all the way up to their uber-rare and amazingly complex VOS and VORS wines that hearken from ancient and well-kept soleras. The heart and soul of Valdespino, of course, is its vineyards. They are the only sherry house to make a series of wines from a single vineyard, called Macharnudo Alto. This parcel is considered one of the "grand crus" of Jerez because it is located at the highest altitude and on pure Albariza soils (bright white chalk). The single-vineyard Macharnudo wines are also considered part of the Grandes Pagos de España, an elite group of very special vineyard sites throughout Spain, and Valdespino is the only sherry house with this status. They are also one of a few estates that take the solera system to the extreme going way beyond DO minimum regulations for all the categories. 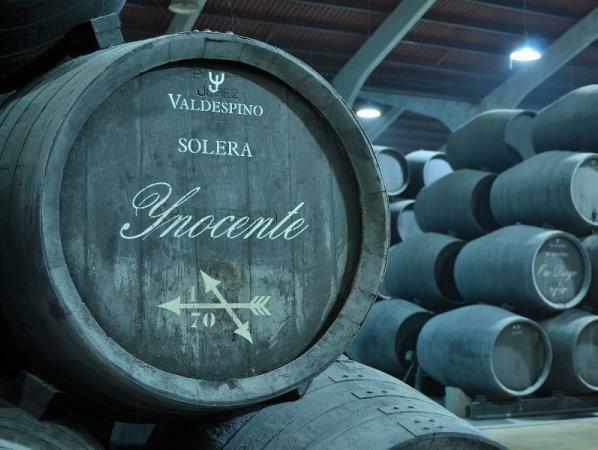 As an example Fino sherry is required to have 2 criaderas (nursery levels of the solera) and the DO average tends to be 3 – Valdespino's Fino Inocente has 10 Criaderas! This additional aging, of course, gives the wines an additional level of complexity, texture and concentration. When it comes to food and wine pairings – sherry has a lot to contribute. One unusual aspect in this regard is that biologically aged wines (those aged under veil of flor) possess umami. This savory/earthy taste characteristic is very pronounced in the biologically aged wines of Valdespino because of not only their natural winemaking techniques but because the wines are aged well beyond the average for their peer group."